Orange and Blue lines have returned to normal service after single-tracking this morning. The trains on the Silver Line have also returned to normal operation between Wiehle-Reston East and Largo Town center. But customers should still expect delays. Track work on the Red line will continue to cause delays. Metro says Red Line trains originating at Silver Spring will turn back at Farragut North until 3 p.m. due to the scheduled work. The Monday morning commute was a rough one for Metro customers after a series of issues plagued the Orange, Blue, Silver and Red lines. Service on the Orange, Blue and Silver lines was delayed for the entire morning commute after a small fire was reported between the Minnesota Avenue and Stadium-Armory stations. The fire broke out on the tracks just after 4 a.m., according to Metro spokesman Richard Jordan. He says that fire was put out using a fire extinguisher. A train testing whether the track was ready to open after the fire became disabled outside Stadium-Armory. Blue Line trains were single-tracking between Stadium-Armory and Addison Road; Orange Line trains were single-tracking between Stadium-Armory and Cheverly; and Silver Line trains were only operating between Wiehle-Reston East and Ballston. Riders on the Red Line are also dealing with a number of delays. Just as the morning commute was getting underway, a switch problem was reported outside the Friendship Heights station. Meanwhile, trains outside the Bethesda station are operating on a speed restriction due to a track problem. Riders shared their frustrations over the slow Monday morning commute on Twitter. "First train out of Shady Grove, normally takes 35 min to Metro Center, took 2.5 hours this morning. Why no alert?," Michael Firestone wrote on Twitter. "Thanks @wmata for yet another morning commute where I wait 15 mins to go nowhere, still pay for privilege of doing so & then must take Lyft," said Patrick McHugh. 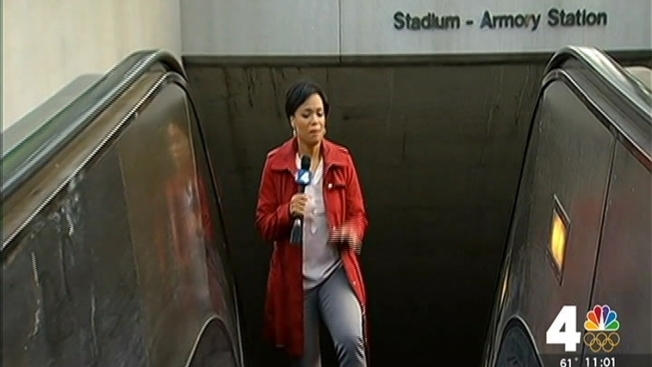 Metro has not said whether passengers will be refunded for Monday's messy commute. Last week, Metro General Manager Paul Wiedefeld detailed a year-long maintenance overhaul for the transit system. "SafeTrack" would close the system at midnight every day, implement continuous single-tracking and shut down parts of the rail line for the next year.